I sat on the window seat of my room at night, crying for Stefan and Damon. My crystal was burning, but I kept it around my neck, the pain was good, it took away some of my emotions. I grabed my cape and snuck downstaris, barefoot. The cold helped. I walked to the stabled and went to my horse, Dragon. He grew exited when he saw me. I gave his a sad smile and stareted to pet him. He neighed and I shushed him. My hair blew behind me I closed my eyes for a second then Opened them again. There was a man infront of me. I tryed to stop Dragon. He threw me off and Kept running. I screamed and The man came toward me, Makeing me scream even more when I saw Damon. "Lizzie..." He breathed. "Its me! Lizzie Its Dami! Its your big brother! I shook my head. "N-no! Damons dead! I watched him die! Stefan too!" He shook his head. "No Lizzie! No! We&apos;re not dead! But Father is! We have to get you away!" I fought against him. "No! Its not Damon!! Your not him." He got on his knees and Looked up at me. Damon grabed my hand and gave it a gentle squeze. I looked into his eyes. My eyes staring back at me. My necklace cooled down a little. "Piccolo its me." I calmed down. "Dami... Your not dead! How?" He stood up and Hugged me. "I&apos;ll explain later! 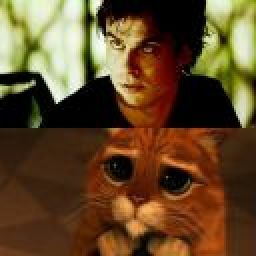 Right now we have to-" Damon was thrown into a tree and green eyes faced mine. "Eli!" I was pulled into a hug. I screamed. "Damon!!" I looked at who was infront of me. Stefan. My necklace started burning again. I pounded on his chest an he let go of me, ran away, and I fell and my head hit a rock, cracking open. Dami ran torwards me again and his face was different, His eyes were red and there were veins around them. Inplace of his teath were fangs. I screamed. "What are you!?" "So you would kiss the sun goodbye?" Damon looked at me with pleading eyes as the new voice circled me. It sounded innocent but loud, like a little girl. My necklace heated up even more. "Please Lizzie, take it!" His blood ran down my throat, I tryed to cough it up but Damon foresed me to take it. My heart was pounding, I could hear it in my ears. This was too much. "LIZZIE!!" I took it startled, Damon had rarely ever yelled at me. "Thats it... Good girl." He looked at me calmer, and wrapped his arms around me rocked me back and forth. I cryed and clung to his shirt. "Hide behind the face of a monster..."
"You won&apos;t be a monster Piccolo. I promise!" He was crying too now. "I&apos;m sorry!! I couldn&apos;t let you die!! I can&apos;t live without you..."  We sat there for a while. My eyes started to droop. I continued to cry silently. My grip on Damons shirt loosened and I closed my eyes comepletly. "Time is nothing, child of the night..."
I gasped and sat up, Causing me to fall off the couch and on to the floor, on Stefan. I was crying. Both of my brothers woke up and Damon ran to me he wrapped his arms around me. I took small, frantic breaths and grabed on to Damon. "Eli!!" Stefan said panicked. I was sobbing now, still Grabing on to Damon. I could barley breath and my brothers started to panick. "It was just a dream!" I franticly shook my head and started to cough. Gasping after every one. "ELIZABETH!!" My brothers shouted together. I jumped, scared. "I-I *Gasp* D-dont wanna *Gasp* be a m-monster!!" Stefan sat directly behind me, His stomach pressing agaisnt my back and Damon hugged me tighter. I leaned my head back on stefans sholder and continued to cry, my eyes closed. They both shhed me every time I made a noise and Stefan got up after a little while leaving me with Damon. I buried my face into Damons chest and he played with my hair. My tears stoped and my sobs turned into hiccups. Stefan came back with a mug of something. I took a sip and coughed. I shook my head. It was warm milk and blood. "Drink it Eli..." Stefan said smoothing my hair. I shook my head. "No." I said in a small voice. "I just want blood..." Damon nooded and I went to his neck and bit I calmly drank and felt better. My head rooled back and I removed my human teath came back. Damon and Stefan softly laughed and Stefan wiped my face. I whined. "Shh..." I was liffted and we went upstairs. We layed down and Damon whispered in my ear. "Sleep Lizzie." I took a breath. "We love you too. "They said together. I fell asleep.